Essential (Inherent): Something that exists naturally in that thing; something that cannot be affixed to that thing later. Affixed: Added or happening later. Union of opposites: Two opposites coming together; juxtaposition of opposites. In this realm, no attribute of any creature is inherent. That is, they do not belong to those creatures; they are the grants and gifts of God Almighty. 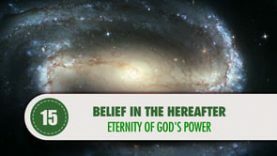 The inherent attributes belong to God because the universe was created later and the creatures in it were created later, too. The universe is not pre-eternal; it was created later. If something is not pre-eternal, its attributes cannot be pre-eternal and inherent, either. However, we will assume some things to be inherent so that the sentence belonging to the Islamic scholar Badiuzzaman Said Nursi will be understood. Those attributes were created later but they can be regarded to be inherent to some extent because they were affixed to those things when they were created. For instance, the light of the sun is inherent to some extent because the sun was given its light when it was created. Therefore, darkness, which is the opposite of light, cannot have access to it; that is, darkness cannot approach the sun. It is a rule that “when something is inherent, its opposite cannot have access to it”. However, the light of the lamp is not inherent; it was affixed to it later; therefore, darkness, which is the opposite of light, can have access to the lamp because it does not belong to the lamp. 2nd Example: The heat of the sun is inherent to some extent because the sun was given this attribute when it was created. Therefore, cold, which is the opposite of heat, cannot approach the sun because when something is inherent, its opposite cannot have access to it. As for the heat of the stove, its heat is not inherent; that is, the stove owns the attribute of heat after something is burnt in it later. Therefore, cold, which is the opposite of heat, can have access to the stove. When the wood inside a stove ends, the stove cools after a while. 3rd Example: The brightness of some substances like gold and diamond are inherent to some extent; fading and tarnishing cannot have access to them because when something is inherent, its opposite cannot have access to it. The brightness of a varnished object is something affixed to it; so it is bound to fade and tarnish. Dimness, which is the opposite of brightness, approaches that object and makes it fade. 4th Example: The movement and rotation of the world is inherent to some extent; therefore, stillness, which is the opposite of movement cannot have access to the world. The world rotates continuously. However, the movement of a peg top or a bicycle tire is affixed to them later; that is, to rotate is not an inherent attribute of them; so, they can be still. RESULT: If something is inherent, its opposite cannot have access to it. The power of God Almighty is inherent. It exists with God’s existence. It is not something that was received or obtained later. God is pre-eternal; his attributes are also pre-eternal, endless and absolute (they cannot be limited). Since the attribute of power is an inherent attribute of God, weakness, which is the opposite of it, cannot be affixed to God. Since weakness cannot have access to God, there are not and there cannot be any degrees in the power of God. Since there are not and there cannot be any degrees in the power of God, He can create thousands of universes any moment if His wisdom finds it necessary. There is no difference between a drop and an ocean or a flower and stars for the sun’s act of giving light; similarly, there is no difference between a little and a lot, big and small, partial and total for the power of God. Atoms and stars are equal in terms of creating and controlling them. It is the same for God to create a fly and to revive all of the dead people. He creates a spring as easily as he creates a flower; He creates Paradise as easily. Life is an inherent attribute of God. Therefore, death, which is the opposite of this attribute, cannot approach God; so, God is eternal. Sight is an inherent attribute of God. Therefore, blindness, which is the opposite of this attribute, cannot have access to God. God sees everything at the same time; nothing can hide itself from the sight of God. Hearing is an inherent attribute of God. Therefore, deafness, which is the opposite of this attribute, cannot have access to God. God hears all sounds and even what the heart thinks of at the same time. The beauty of God is inherent. Ugliness, which is the opposite of beauty, cannot have access to God by any means. God knows a fish swimming at a depth of thousands of meters under the sea. He knows an ant walking in the darkness at night. No leaf falls without His knowledge. He knows what all hearts think of… They originate from the fact that the attribute of knowledge is an inherent attribute of God. Not to know even one of them is ignorance. Since the attribute of knowledge is inherent, ignorance, which is its opposite, cannot have access to him; thus, God knows everything. We can regard the other attributes of God Almighty based on the same rule. The degrees of light are caused by the intervention of darkness, which is its opposite. The degrees of heat are caused by the intervention of cold, which is its opposite The degrees of beauty are caused by the intervention of ugliness, which is its opposite. The degrees of fullness are caused by the intervention of hunger, which is its opposite. If the opposite of something cannot intervene in it, there will be no degrees in it. God has no opposites. Since God has no opposites, there is no intervention in God’s acts. Since there is no intervention, there cannot be degrees in the power of God. His power becomes endless. Since His power is endless, it is the same for that power to create a flower and to create a spring, to create a fly and to revive all of the creatures after their death. One of His acts will not prevent His other acts.